Here are two quintessential warm-weather hues that are truly excellent for Summer. Use melon as your main focus, or even just aqua, or wear them together to give any outfit a much needed pop of summer color. 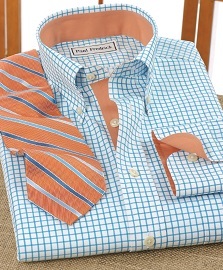 This pairing works well with brown and tan, as well as with other shades of orange and blue. Sky blue is one such shade that goes great with melon – and in fact, these two colors make up another one of our favorite Summer combinations! To tone an outfit down, utilize less melon and more of whatever other colors you’ve chosen, including aqua. A tan suit with an aqua dress shirt and melon accessories can be a superb way to celebrate the season in style. 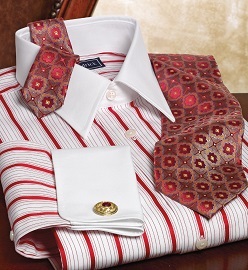 Red is unquestionably eye-catching – its boldness draws some men to it, but at the same time makes others wary. Utilized in the right manner, this color can be a game-changer for your wardrobe. Start off with red accessories like cufflinks and ties; dark reds are more conservative because they are not quite as ‘loud’ as their brighter relations. A crisp white dress shirt or one with red patterning works, since pairing white with red softens it and makes it a perfect fit for a number of outfits. In addition, red goes well with tan, gold, yellow, blue, and black. In general, try to use red as an accent color rather than as your base. Mint is a shade one might describe as a light green. It’s an ideal shade for Summer thanks to its freshness and balance between the subtlety of a pastel and the exuberance of seasonal color. 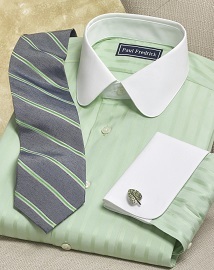 Mint has some blue tones as well as green, so matching mint with blue makes for an immaculate pairing. 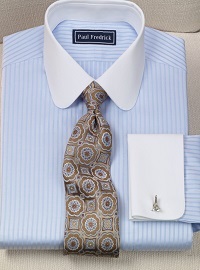 The most straightforward way to achieve this is to pair a mint dress shirt with blue, perhaps navy, dress pants. You can take mint and blue into the casual realm with the use of a mint sweater. In addition to blue, mint will pair with grey, other greens, and of course, white. Yes, we know that tone-on-tone isn’t exactly a color, but we’ve seen this trend make it big in Summer and felt it deserves special attention. An ultra-sophisticated version of beloved patterns like stripes, herringbones, grids, and more, tone-on-tone has been appearing in some of the most popular Summer hues. Since the same color is repeated – hence “tone-on-tone” – remember to bring in another complementary hue to break up the monochromatic scheme. From white-on-white to light blue, to pink, to melon, our tone-on-tone offerings will hit all the right notes for your wardrobe. Melon + Aqua, Red, and Tone-on-Tone are a few of our favorite Summer shades. What color or colors do you find most seasonally appealing? I like the round collars. Are they available on all shirts? And are all the summer colors available in short sleeves? Very nice color combinations here. Thanks for sharing! Jorge, we appreciate your feedback! Never try Melon + Aqua combination but i think its nice to wear.